This website is supported in part in cooperation with the Southeastern Minnesota Arts Council through funding from the Minnesota State Legislature. furniture, home decor and art pieces. and designing graphics for the home decor and wooden signs that Matt constructs. tribute to the heritage of the family farm. and has had many gallery shows throughout the country. He studied art at the University of Minnesota and continues studying today. The next presentation of the Dorothy Godtland Lecture Series will be the "Art of Doll Making" by Agnes Boss. The presentation will be held May 17 from 7-8pm at 226 W. Clark St. The Art Center doors will be open at 6pm. This presentation is FREE and OPEN to the public. Ninety-four year young Agnes Boss grew up in Nebraska, attended college, taught country school, worked in California as a civilian for the Air Force during WWII, attended business school, and worked at Fairmont Foods where she met her future husband. She is a mother of three, grandmother, great-grandmother and talented artist. As an artist, she carves wood, paints portraits and landscapes with acrylics and oils, designed and built the July 3, 2011 Albert Lea Art Center award winning parade float "American Gothic", and imagines and creates dolls made from wood, fabrics, wire, sculpty and even dried apples. Agnes will share with us the techniques that she uses to build and create her hand-made, one-of-a-kind and unique dolls. As part of the Dorothy Godtland Lecture Series - this month is "Art of Tai Ji Quan". Carol Soma, Kiester, will be presenting a session on Tai Ji Quan from 7 pm to 8 pm on Thursday, Sept. 21, at the Albert Lea Art Center, 226 W. Clark St.
Tai Ji Quan: Moving For Better Balance is a 12-week class to help older adults improve their balance and reduce the likelihood of falling. Research has shown that people who complete the program are half as likely to fall and are less fearful of falling. In addition to improving balance, the program also focuses on muscle strength, flexibility, and better breathing habits. This is the third year Senior Resources of Freeborn County has sponsored the class with a three-year grant from the Southeast Minnesota Area Agency on Aging. Soma has always had an interest in the arts, and currently is an active board member and volunteer with the Kee Civic Theatre in Kiester, a non-profit group that restored and now operates the Kee as a movie theatre and community performance space. 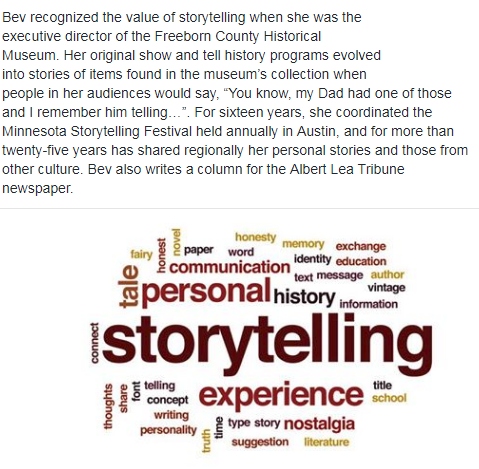 She currently represents Faribault County on the Prairie Lakes Regional Arts Council, which serves the southwestern part of the state. Before retiring a few years ago, she was the media specialist at the Blue Earth schools, and previously taught English and Spanish. In addition to tai chi classes, she teaches and studies yoga in the area. In her other very part-time job, she is a caregiver consultant with Interfaith Caregivers of Faribault County, facilitating a Caregiver Support group in Kiester and a Parkinson’s Support group in Blue Earth. She and her husband Brad have two children and five grandchildren, so they often find time for visits. Reading for her two book clubs and a garden keep her busy at home. “Taking Your Creativity to the Next Level,” a lecture by Rosalie Truax, will be given at 7 p.m. Aug. 17 at the Albert Lea Art Center. Truax, an Albert Lea Community Theatre volunteer, and her husband, Roger, have lived in Albert Lea since 1965. She is a retired educator who taught at Albert Lea High School, Riverland Community College and community education. She spends her time in retirement volunteering and pursuing hobbies like quilting, writing and decorating. Her favorite activity is costuming community theater productions. According to a press release, Truax wants to expand people’s concepts of creativity as it relates to their world during her lecture.Please join us!